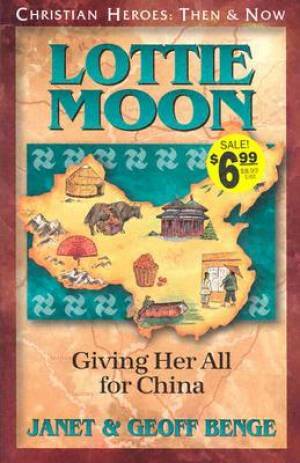 After becoming the most educated woman in the American South, Lottie Moon (1840-1912) spent thirty-nine years in China. As she watched her fellow missionaries fall to disease and exhaustion, she became just as dedicated to educating Christians about the often preventable tragedies of missionary life as she was to educating Chinese people about the Christian life. Today, an annual missionary offering taken in her name continues to enable countless others to give their all for the gospel. Lottie Moon by Janet & Geoff Benge was published by Frontline Communications in June 2001 and is our 27913th best seller. The ISBN for Lottie Moon is 9781576581889. Be the first to review Lottie Moon! Got a question? No problem! Just click here to ask us about Lottie Moon.